With two small kids and an hour drive to my in-laws, I am incredibly appreciative of kid’s music that doesn’t push me to the brink of temporary insanity. 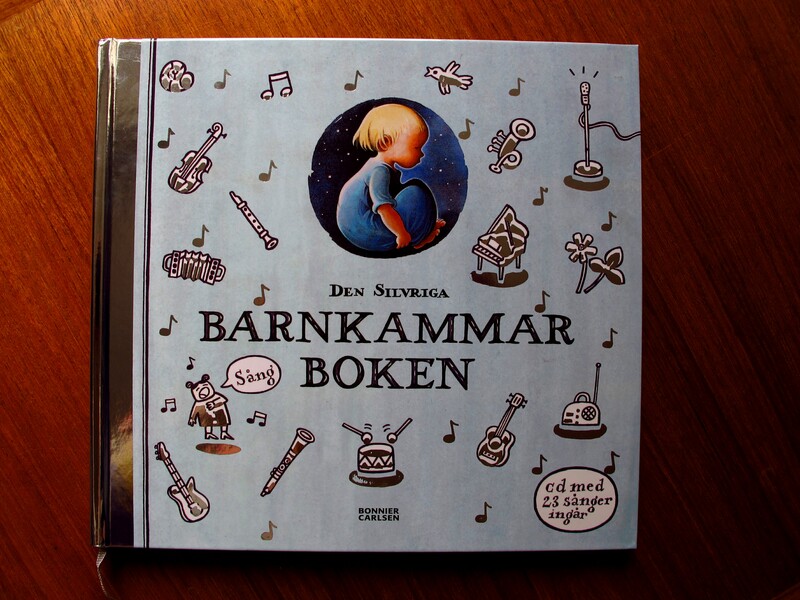 After listening to it hundreds of times, Barnkammarboken, Den Silvriga (Nursery book, Silver) is still a CD I enjoy. Maybe I haven’t tired of it too quickly because it took me about a year to figure out what they were singing about (ok, I am still a little confused sometimes, but that’s ok). There are soloists and groups, from kids to adults, singing with accompanying music that is for the most part simple and charming rather than overbearing or obnoxious. 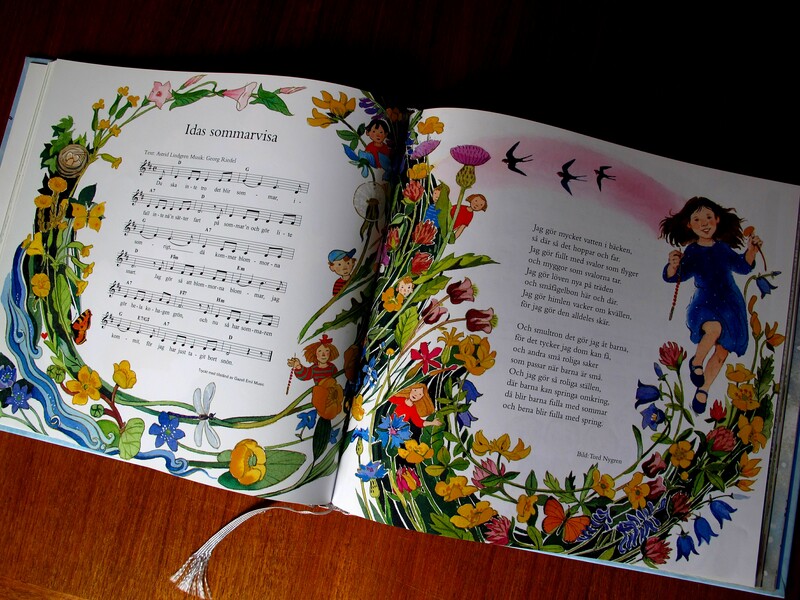 The 23 track CD can be purchased separately or along with a book of the same title that includes 95 songs, each with basic music notes, and illustrations by many well-known Swedish artists. I can truthfully say that out of 23 tracks, there is only one that really grates on my nerves. I managed to successfully skip over Ketchup Ska Prutta (literally ‘ketchup will fart,’ accompanied by bongo drums) for many months before my eldest daughter caught on to me and now I suffer through it. Thankfully it’s a short track. But aside from the ketchup pain, I highly recommend this compilation of Swedish classics and modern children’s songs. I wasn’t able to find a site where you can listen to samples of each song, but I did find an upload on YouTube of my favorite track, Idas Sommarvisa by Astrid Lindgren (the author of the Pippi Longstocking books). The song was originally written for the 1973 film Emil och Griseknoen (Emil and the Piglet) and sung by Lena Wisborg who played Ida. The YouTube video is the actual clip from the film and includes Swedish subtitles. I’ve posted the Swedish lyrics and an English interpretation below. Today it is often sung by grade school children in their final procession on the last day of school. Note that there are several books in a series called Barnkammarboken, but the one I am recommending is Den Silvriga (Silver). The song list is at the bottom of the post. All of the songs are in Swedish and the age recommendation is for 0-6 years old. Whether you decide to purchase the book and CD, or just the CD, this is a lovely addition to a young child’s music collection and I can only hope that any adults within earshot will be as relieved as I am to have a kid’s music CD we can all enjoy. Unless, of course, Ketchup Ska Prutta is playing and then I ask that you please hold me blameless. then the flowers will soon bloom. because I have taken away the snow. so it swirls and rushes. and mosquitoes for the swallows. and small bird nests here and there. for I make it all rosey. that suit children when they are small. and their legs are full of life. I love these too! Most English (can’t speak for American) nursery rhymes seem to either be about the plague (ring a roses), violence and royalty (song of sixpence). These songs are gorgeous and are beautiful songs in their own right whether for kids or adults. My personal fave is Lille Katt, but inevitably my kids love the farting ketchup song! Ho hummm! Maia, i ordered this after reading the blog… the CD is fab in the car and i have to confess to humming various catchy tunes all the time at the moment.. and the family had quite a laugh at the weekend when Taylor happily sang Oi,Oi, Oi Oi at the top of her lungs ! Oh Mrs Nilsson, this is beautiful. I was looking for a good translation of Ida’s sommarvisan and I found it here. Great job. I love Swedish children songs and sort of collect them in my little collection. Have you written about other Barnskivor anywhere else in your blog? I’m glad you found what you were looking for. I haven’t recommended any other Swedish children song’s collections because I haven’t liked anything else I’ve heard as much as this one. But there are several different albums in this Barnkammerboken series so you could check those out. We have the blue album as well, but I’m not loving it. Good luck finding something else you might enjoy. We received the whole collection of these books for my daughters first birthday. They make great gifts. They truly are amazing books! I too come from the states and I wish there was something like it in English. If you know of something like it in English I would love to know! Thanks for posting, Your blog is a replica of my life in Sweden thus far! It nice to see some oneelse experiencing the same things from an American perspective.